There’s a new holiday that everyone should celebrate. “Obscura Day”—an international happening of environmental discovery. This year, it took place worldwide on Saturday May 30. Sponsored by the online website Atlas Obscura, Obscura Day is like an “art crawl” evening of neighborhood galleries, except that the sites are all over the world. Here in Minnesota, we had two Obscura sites open to the public. Actually, Atlas Obscura lists roughly ten sites for our state. Check the Atlas itself for places near you and in 30 countries. You will find a variety of hidden and fascinating attractions for family fun. Our two Obscura Day sites included the Wabasha Caves in Saint Paul—large natural rooms in the limestone bluffs of the Mississippi River that have been the home to Native Americans, Gangsters from Chicago, and a supper club. 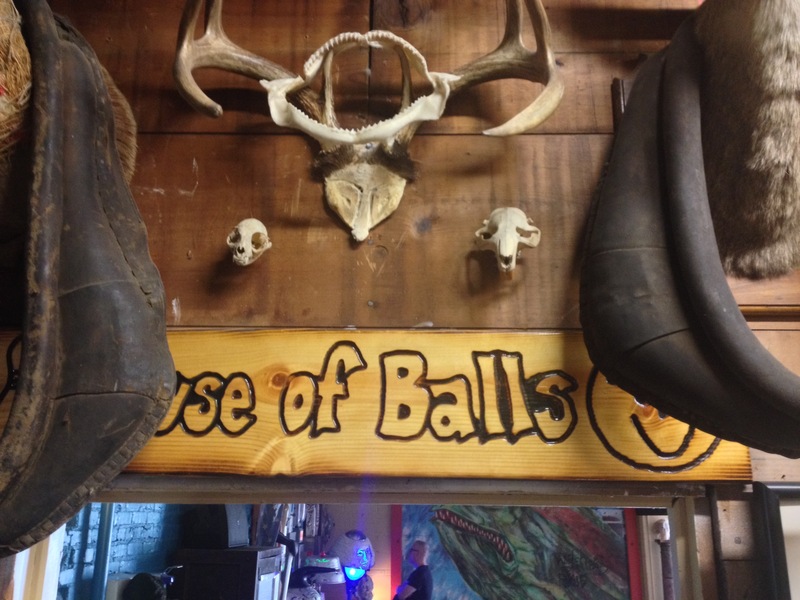 I made it to the Minneapolis site—the memorably named “The House of Balls” (HoB). 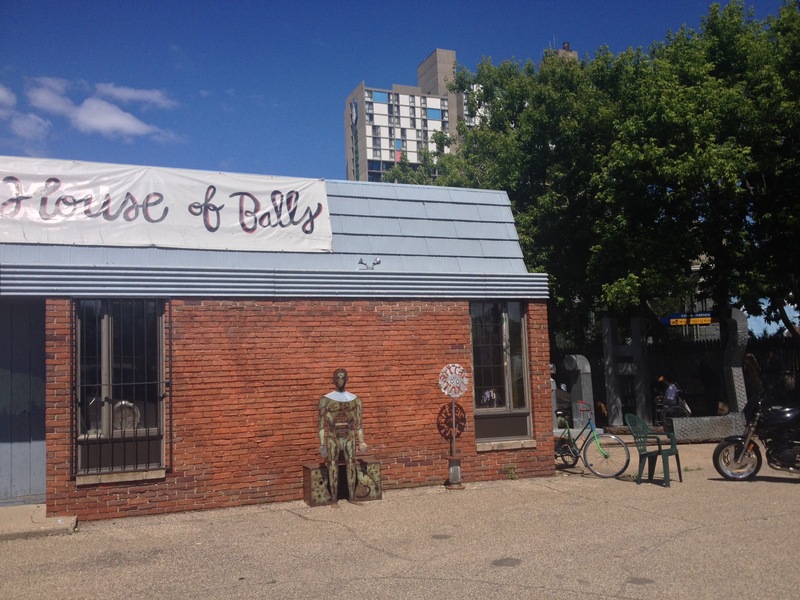 Many Minneapolitans have heard of the House of Balls and recall its unusual name, perhaps because it is open to so many interpretations. But not so many people have actually been there. My friends and I were particularly lucky to be among the first to visit their new home in a former gas station near Cedar-Riverside in Minneapolis. 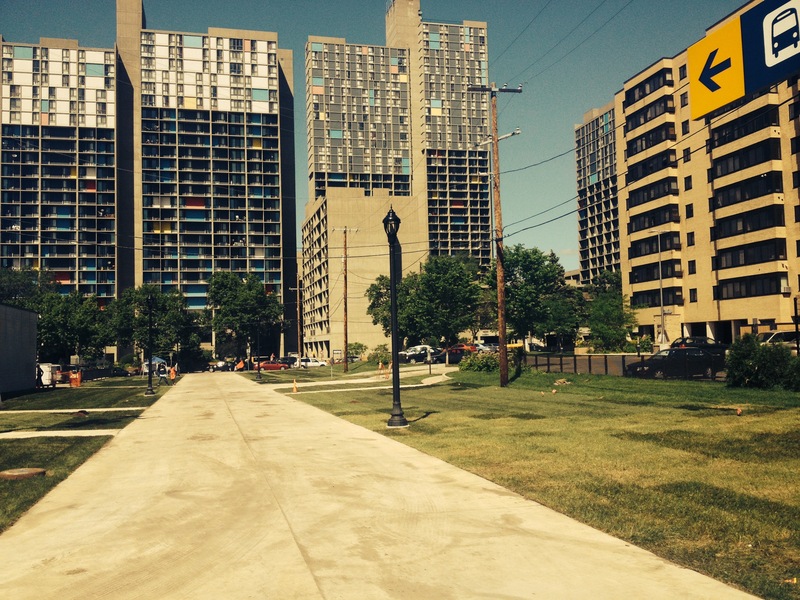 Designed by Ralph Rapson, FASLA, “Cedar-Riverside” was one of two “New Town in Town” projects sponsored by HUD in the late 1960s to build mixed-income communities in cities. The other is Roosevelt Island in New York. With its bright panels and cast concrete structure, Cedar-Riverside is now home to one of the largest populations of Somalis outside Somalia. It’s just across the light rail stop from House of Balls’ far more humble gas station home. They make a nice pairing. 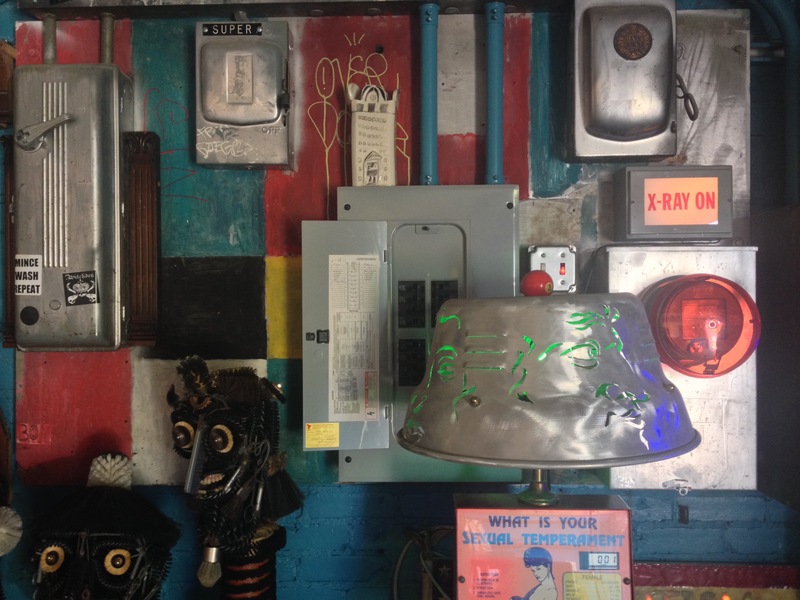 Founded by artist Allen Christian several years ago, HoB has grown from a small bowling ball and sculpture collection/studio to a work of environmental art. Inside, each of the rooms, the old bathroom, office, waiting lounge, and the garage bays has a distinctive character. Filled with Allen’s art that I will not even try to describe (see photos instead), the new House of Balls is like a museum of period rooms…each stylistically-unified with its own strong aesthetic. Yet the art rooms at House of Balls come from no particular period but rather Mr. Christian’s imagination. I first met Allen when his House of Balls art truck took part in the ice art car parade that I described herein in February. Well, it’s a lot warmer now and I took a summer photo of the truck to pair with my winter shot. 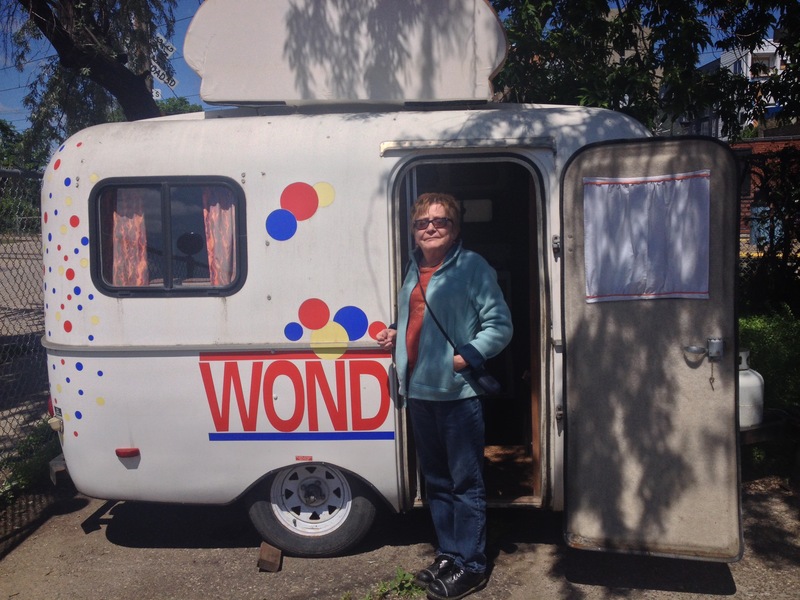 Allen also has a fine Scamp trailer outside customized with Wonder Bread dots. Inside, there’s a little model of it. 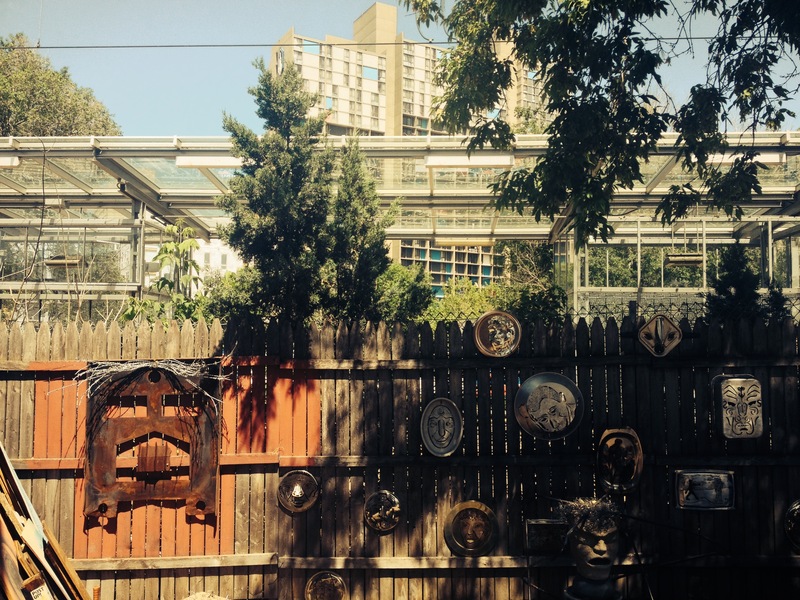 By the garage bays, just by the boxelders and light rail stop, there’s a sculpture garden with large galvanized ducts that Allen has carved out with a plasma torch. You can see the Cedar-Riverside towers in the background. As a special event for Obscura Day, he let visitors try to the torch out on their own. 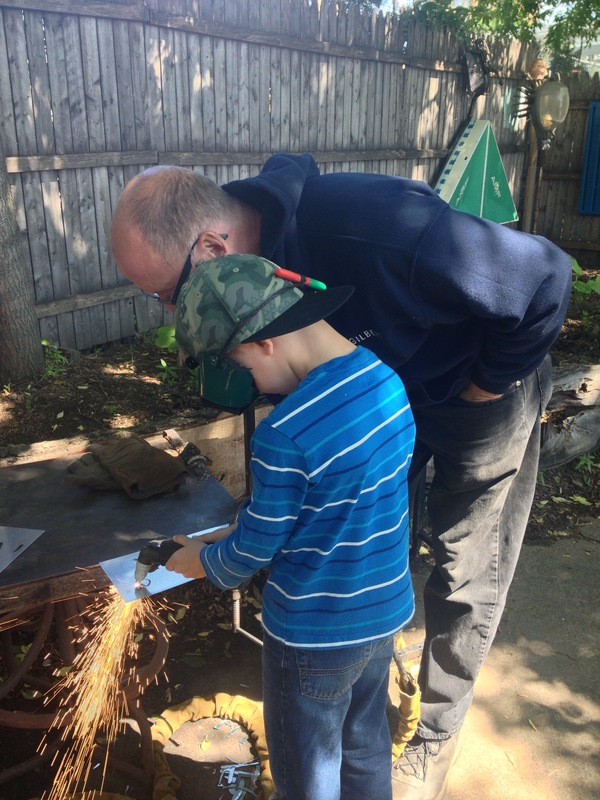 I watched a few people carve their names in letters on small steel slabs. The sparks burned white hot as they flew through the metal. I’ve always been afraid of complicated tools and hot things like welding. But, Allen calmly worked with the visitors as they cut their art. And finally, after a boy and girl did it, I thought, “what the heck, my deep fears about this plasma torch are just ridiculous.” So I put on heavy goggles and tried it too. I was a little nervous at the start (see Bethesda posting herein about putting gas in my car). But then I got going, cutting out a kind of fleur-de-lys tree that I’ve always drawn. I remained a bit jumpy and went too fast so the torch cuts didn’t quite go through the metal. Allen told me to slow down, and I did. When the tree was done, I was so proud and showed it to my friends. They were polite and said nice things…looking a little surprised that I had actually used a plasma torch. 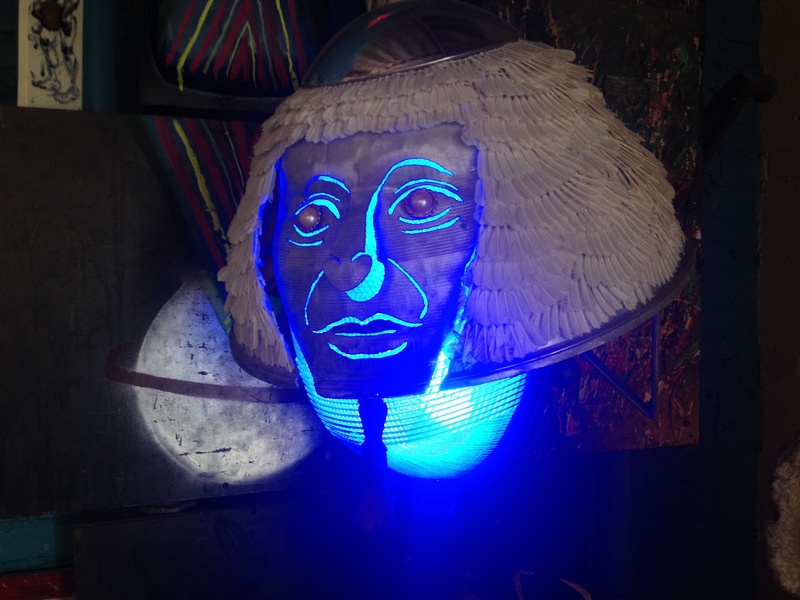 I was too really…and learned that one of the best things about obscure places and participatory art is how they afford us new insights and daring feats that we thought we’d never try. In the summer, Lake Minnetonka is one of the Midwest’s greatest lakes—with 22 bays, lost wooded islands, and 90 miles of shoreline. There are thousands of boats and a lot of wealthy people whose vast mansions and McMansions you can only comprehend if you see them from water in a boat. But you have to have a boat. In the winter, everything is different and more populist. You can set up a garish “ice house” made of plywood right out there on the lake where you can fish and drink bourbon and do other things. Or, you can just drive from town to town across the lake on the route of the old streetcar company boats. Sometimes they even plow roads. Or, you can make the mistake that I did and try to show some supportive interest in a friend’s hobby. Specifically: Carol’s 1995 Toyota now transformed as an “Art Car”. I drove out to the lake to watch her art car “club” take off from the Excelsior public dock for a winter parade…sort of like the parades they do in summer for the State Fair and around the parkways. I thought I’d be enthusiastic and wave to them while taking photos from the shore. 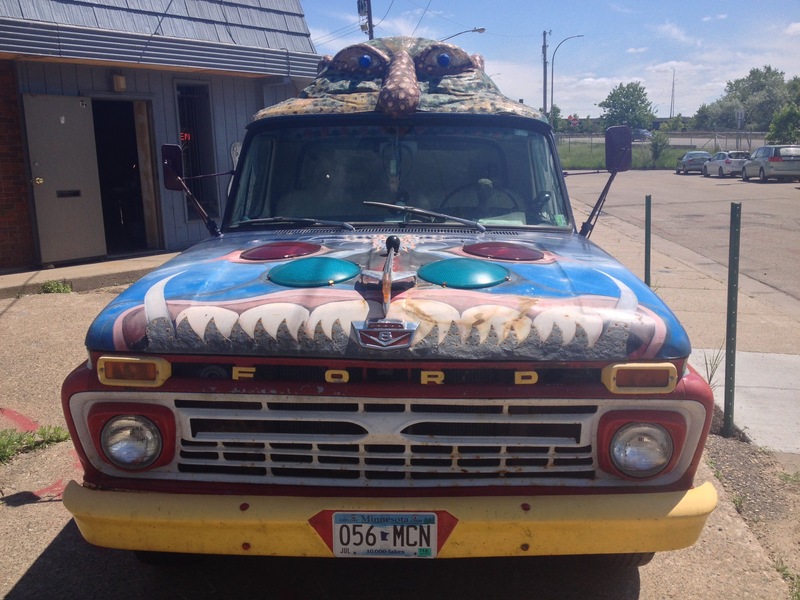 Art Cars are a bit of a local feature here in Minnesota. I remember them from when I lived in Saint Paul in the early 1990s…generally old models decked out in special paint or Astroturf or something like that. Students from Macalester College often made them and it turns out that their art professor…who started the whole thing…was part of the small group that cold day with her boxy Volvo sedan! Normally, there would have been many more cars, but it was a really a bright, cold and windy day. The wiser artists stayed home. There were only about six—one of them being a pickup from the House of Balls, a well-known local studio with a memorable name. I don’t know how or why, but Carol persuaded me to go along on the winter ice parade, sitting in the cramped back seat of the Celica. This is a car that has had a hole in the floor on the driver’s seat side for at least the last five years. Seemingly dangerous even in summer conditions, I should have known better than to do this in this car. With all of its plastic figurines (sharks, Barbies, ponies) stuck on, Carol’s art car is terrifying in the way that strange clowns are. The added peril of going through the ice only heightened my tension as we left the shore. There were six cars in our pack and I rode in the back of the Toy-oh-Tah (those are the plastic letters on the trunk) clutching for comfort a kind of kewpie doll that had blown off the roof. Carol took a photo of me just then because she thought this was funny. I did not think this funny. We sped up. Unlike a city parkway, you can actually drive an art car really fast on the open ice and, if you slide of spin out, it really doesn’t matter so long as you don’t get too close to another moving car. At least, that’s the theory. I was surprised how fast the Toyota could go. After about three miles, in the middle of the main channel, the art car in the lead made a gentle U-turn and we started back. In a moment, they all came to a stop in a neat little line to take a group shot. They had done this before. I got out to take some photos and pointed out to Carol a few visible cracks in the ice. This scared her somewhat and I felt a small sense of satisfaction. Then we started up again. 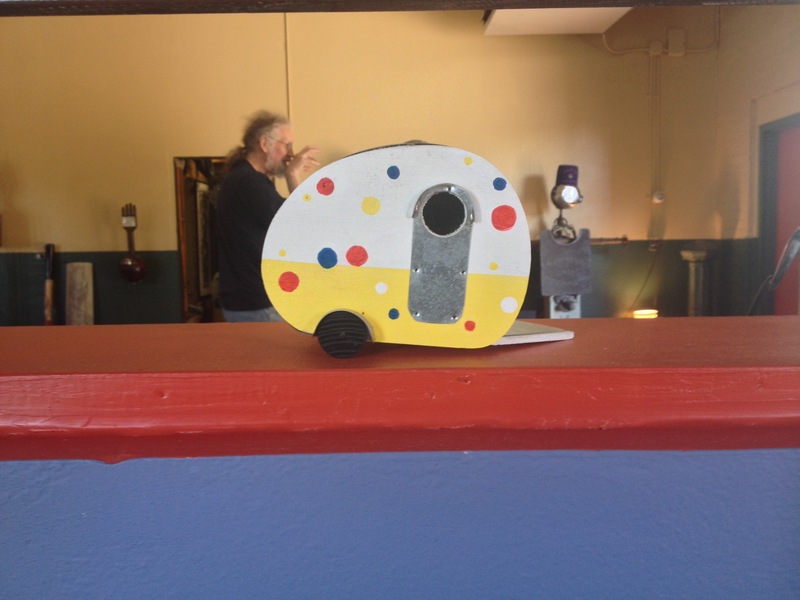 The bright moving colors of the art cars brought back memories of the boxy ice houses that used to cluster in little cities in many of the bays. As strange as the conditions were, or perhaps because they were so unexpected, I was momentarily taken back to the Lake Minnetonka of my youth when there were fewer big houses on the shore and more ice houses on the lake. After too many months indoors, I sensed for an instant the fleeting nature of human life outside at thirty below in a vast, flat, white and open space. Then I caught a glimpse of the promise of surprises and how they add some color to the long horizon of mid-winter months. This was something bright and strange that I’d long remember. When we neared the shoreline, I pointed out a DANGER THIN ICE sign to Carol. She was upset again. But I knew that we were close enough to shore that if we broke though, we’d only sink a few feet and could easily wade back to land.